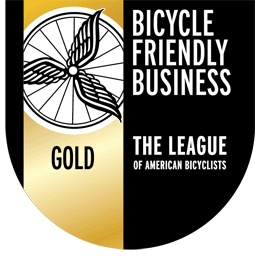 Representing injured bicyclists statewide and helping make our streets safer for everyone. Whether you've been doored, T-boned, rear-ended, right-hooked, left-hooked or even thrown from your bike by a road not fit for ordinary travel, the lawyers at Washington Bike Law have the experience to help. If you were injured in a bicycle accident in Washington State, contact the bike attorneys who are committed cyclists themselves. They understand what you are going through and are motivated to help. appellate advocacy if a judgment is appealed. Peer Review Rated by Martindale-Hubbell AV® Preeminent™ 5 out of 5. Bob was first rated AV in 2002 and has maintained this rating since. AV® Preeminent™(4.5-5.0) is a significant rating accomplishment - a testament to the fact that a lawyer's peers rank him or her at the highest level of professional excellence. AVVO rates Bob as a on a scale of 1 to 10 for experience, industry recognition and professional conduct. Washington Bike Law's lawyers provide experienced trial court and appellate-level legal advocacy. Washington Bike Law's attorneys have the courtroom credibility to resolve most cases without filing a lawsuit. If litigation is required, Washington Bike Law has the financial resources to keep fighting until justice is achieved. In law school, Washington Bike Law's founding attorney Bob Anderton planned to do pure public interest law work. But in 1992 Bob had the opportunity to work with acclaimed trial lawyer Tom Chambers and began representing catastrophically injured people and their families. Tom Chambers served as the President of the Washington State Bar Association and, in 2000, became a Washington State Supreme Court Justice until he retired in 2012. After learning the best practices in the profession, Bob Anderton started Anderton Law Office. The phrase "bike law" did not exist then, but Bob had always been a bicyclist and found that he really enjoyed representing bike people. Without ad campaigns or even a business plan, bicyclists gradually became the majority of Bob's clients. Bob advocates for individual clients and provides pro bono advocacy for bicycling and safer streets. Attorney Jessica Cutler brings to Washington Bike Law the perspective of a professional bike racer who has also worked as a bike messenger. She offers the motivation and stamina of an athlete and applies it to the law. Attorney Rob Levin brings more than a quarter century of litigation experience to Washington Bike Law. Rob spent many years representing insurance companies and defendants in civil litigation and this experience can help Washington Bike Law's individual clients. Rob is a bike commuter and recreational rider. A long time bike commuter himself, Anderton is Seattle's premier bike lawyer who represents cyclists in and around Seattle. — Anne-Marije Rook, as the Riding Reporter, Ballard News Tribune Vol. 119 No. 40 (October 7, 2011). Ms. Rook is now editor of Ella CyclingTips and former Communications Director of Cascade Bicycle Club. Washington Bike Law provides free consultations and realistic feedback regarding whether it makes sense to hire a lawyer in your particular situation. Over the years, they've helped hundreds of people who didn't require formal legal representation. The attorneys at Washington Bike Law have also seen many bicyclists who didn't think they needed a lawyer whose situations kept getting worse and worse without representation. They helped them, but could have provided more help had they been retained earlier. Getting a free consultation early on is an easy way to protect yourself. While Washington Bike Law's lawyers often provide injured bicyclists with free legal advice, other times they take cases through trial or on to the appellate level. While some cases go on for years, most cases are resolved before trial. Washington Bike Law's experience and track record can help bicyclists resolve their cases fairly and with a minimum of hassle. The bike attorneys at Washington Bike Law understand what it is like to be a bicyclist on Seattle streets and have ridden on roads across Washington State. They've been injured themselves and they know how to help when you've been injured on your bike. Some personal injury lawyers only take cases involving catastrophic injuries. Washington Bike Law focuses on bike law, regardless of the value of a claim. Washington Bike Law will represent an injured bicyclist whenever its lawyers believe that legal representation is in that person's best interest. Washington Bike Law is different. The City refused to resolve the claims out of court and in 2004 Anderton Law Office obtained the first verdict against the City of Seattle for its negligence there (King Case No. 03-2-27338-4SEA). 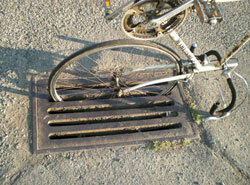 Washington Bike Law works to eliminate wheel-swallowing parallel drain grates like this. Several clients offered to settle their injury claims for no money or attorney's fees if the City of Seattle agreed to inventory and replace these grates (Seattle PI). The City refused and fought the claims instead. The City argued that bicycling is merely recreational and that it had no duty to replace the grates or even to know where they were. It lost those arguments in court. Years later, as Bob Anderton suggested, the City began inventorying and replacing the grates (Seattle PI). Washington Bike Law's commitment to these types of cases does more than compensate individual injured bicyclists; it helps make our roadways safer for everyone. For a free consultation, call (206) 262-9290 or email info@washingtonbikelaw.com. Washington Bike Law has a record of success in helping make Seattle and other cities in Washington safer for bicyclists. 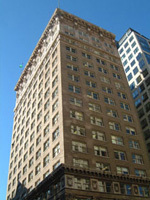 Located in the Hoge Building in Downtown Seattle, Washington.